In September, U.S. 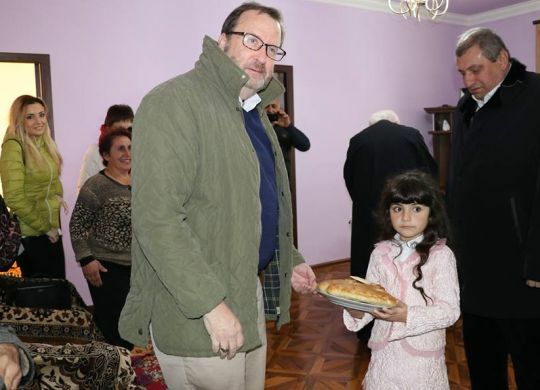 Ambassador to Armenia Richard M. Mills Jr. and volunteers from the U.S. Embassy’s Helping Hands volunteer organization helped the Petrosyan family of Aghavnatun village in Armenia’s Armavir region build a new home. Last week, Ambassador Mills and volunteers were on hand at a blessing ceremony for the Petrosyan family’s new home. “Volunteering is a way of life for many American families, and it’s so meaningful to be able to continue this tradition in Armenia,” Ambassador Mills said. For complete coverage of the house blessing, click here.